Look at this 100% authentic Ray Ban RB5169 rectangular eyeglass frame, an ideal option for the individual with an oval shaped face. This classic frame was made from Zyl, a lightweight and durable plastic. The RB5169 is available in Black, Green, and Brown and is optimized to house single vision lenses. Perfect for daily wear or special occasions, this frame fits right into anyone's collection. 100% authentic brand name eyewear, made by well-known designers worldwide, and adheres to high quality of materials and comfort. Designer eyewear is recommended to be used as the primary pair of prescription glasses. Original case and packaging included. We have a 30-day, no-questions-asked return policy for all our frames as well as a one-year no-scratch guarantee for our lenses; we’ll replace your scratched lenses for free within the first 12 months. 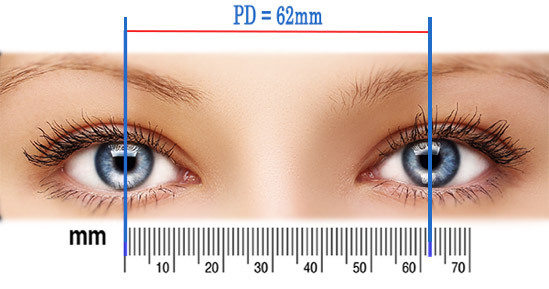 In some cases your vision correction doctor may forget to give you your PD (pupillary distance). The best option will be to ask your doctor to measure it. It is part of your prescription and an eye doctor needs to provide it. If this is not possible, you may use the methods listed below. 1) Wear any glasses with clear lenses. 2) Use a mirror or ask a friend or family member to mark your pupil location on the clear lenses using a dry erase marker. They must stand in front of you and be at the same height as yours. If you use a mirror make sure you stand 3ft from the mirror and your general stare is directed to the center of the glasses. 3) Ask a friend or use your mirror to see the distance on the roller. The distance measured is your PD. Although we don’t recommend this option, if you are unable to use the methods above, you may use the general PD for: Women 62 and Men 64.